The Red Sox turn to Rubby de la Rosa tonight, who is making his first appearance with the big league Sox this season, to keep the win train going tonight. de la Rosa is 2-3 with a 3.04 ERA in 10 starts with the Pawtucket Red Sox and is taking Clay Buchholz's spot in the rotation for the time being. The umpires will have their hands full tonight after tensions flared last night. 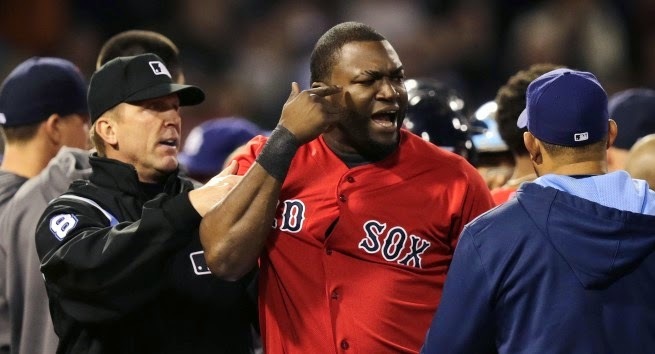 David Price drilled David Ortiz then drilled Mike Carp as well and 3 Red Sox managers were ejected. The Red Sox came away with their 5th straight win, so all is well for now, but fans and the umpires alike will be watching closely if things start getting out of hand. The Red Sox will be facing Jake Odorizzi (2-4, 4.56 ERA), who has had pitched well of late with a 1-1 record and a 2.16 ERA and 20 strikeouts in 16.2 innings in his last 3 starts. The Sox will look to get to Odorizzi today and continue their hot streak, but will have to do so without Dustin Pedroia, who left the game last night with a hand contusion. The initial tests came back negative, but Pedroia will have a followup exam today. In the meantime, Jonathan Herrera will be filling in at 2nd base tonight. Stats and lineup from MLB.com.